This Polar Adventure on the Kola Peninsula combines three activities and three extreme goals in one holiday! Hiking in Khibiny Tundra; you will hike 3 days with backpacks in the highest mountain area of the whole Lapland together and conquer the summit of Kola Peninsula: Judychvumchorr (1200m). 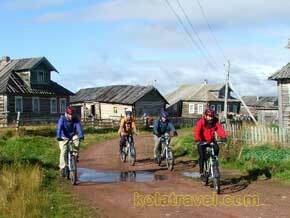 Biking / cycling on the shores of Tersky Coast; you will bike 150 km off-road passing old Pomor villages to reach the most faraway point of the Kola; White Sea cost village Varzuga Bike through forests, over sandy beaches and dunes and stony plateaus. While you are in action we take care for appropriate breaks between the activities with sauna and relaxing moments. You will not be hungry, our guide will take care for that. 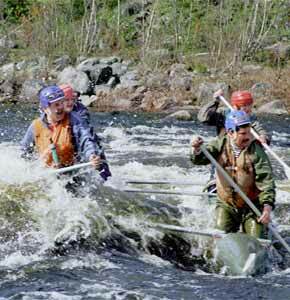 During your tour you will visit the most interesting places on the Kola Peninsula, Khibiny Tundra, ancient rock carvings, Amethyst mine, picturesque fishing villages and wildlife. Day 1. Saturday: Arrival at Murmansk airport and transfer to Monchegorsk. Check-in at a hotel. Dinner in a nice Russian café. Optional: Transfer from Kuusamo or Rovaniemi airport in Finland. Day 2. Sunday: Travel by motor-boat down Imandra Lake to Nifeliny Peski Station (10 km). From there hike on the forest path as far as Aku-Aku Ravine. The Ravine’s entrance is guided by tall pine-trees and the walls look like an old broken castle. There is a picturesque lake among the cliffs, and numerous streams - one with a small waterfall, and lonely standing rocks like trolls turned into stones. Follow the Ravine Aku-Aku up to the Yumyekorr Pass, a narrow pass squeezed between two rock cliffs. Yumyekorr means "Ravine of Dead Men". According to legend the Saami battled Swedes here at the end of the 16th century. Hike down to the Meridian Stream through a grove of northern birches up to the Chasnaiok River ("The Woodpecker’s River"). Overnight in a tent camp. Distance of hike: 17 km. Day 3. 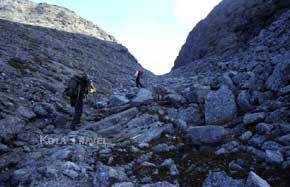 Monday: Follow the path along the Chasnaiok River to the South Chorgorr Pass. We can watch the steep slopes of the Lidichwumchorr Mountains on which there are fantastic rock outcrops. The South Chorgorr Pass is smooth wide lowering of the crest (820 m). At lower elevations there is a stunning rock circle with a jewel-like lake. Proceed down through the pass to the Petrelius River and make camp in the circus of West Petrelius Pass. Distance of hike: 14 km. Day 4. 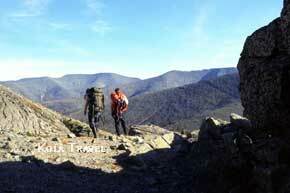 Tuesday: Ascend to the top of the West Petrelius Pass. We leave our backpacks there to hike free to the highest peak of Kola Peninsula – Judychvumchorr Mountain (1200 m above the sea level). Then we come back, pick up our backpacks and proceed down to the valley of the Malaya Belaya River and to a stone circle with "moon" craters on its bottom. 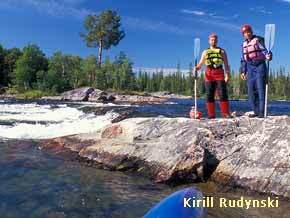 Follow the Malaya Belaya River on the path up to the Ramzai Ravine, also narrow pass between two rock cliffs. Snow can be kept in the ravine up to the autumn. 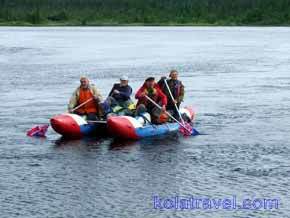 Proceed down along the Pochajok River ("The Reindeer’s River") to the Malyi Vudyavr Lake where our bus is waiting. Transfer to an old village Oktyabrsky where lumberjack guesthouse Yolki-Palki is located. Sauna, dinner and overnight Distance of hike: 14 km. Day 5. Wednesday: Breakfast. Today we prepare the catamarans for tomorrow start of rafting tour. The rest of the day you can rest and prepare yourself too. In afternoon the sauna will be ready. Day 6. Thursday: After breakfast transfer to the end of Umbrozero Lake where the Umba River starts to flow southwards. This is the beginning of your rafting tour on a catamarans. After the start excitement starts immediately with big waves and you get acquainted with the catamaran. Lunch during the day and dinner on the shore of the river. Overnight in tents. Catamaran daily distance: 15 km. Day 7 to 9. Friday to Sunday: Every day after a good breakfast we paddle about 15 km with a snack stop on the water, a lunch break (with campfire) on one the many beautiful shores of the river and at the end of the paddling day we make a camp with campfire and have a good dinner. Halfway we reach Kanozero Lake. We will spend time watching a famous ancient rock carvings; Petroglyphs. These mystic artefacts are dated 5000 years before our era. There is still considerable conjecture as to what purpose the carvings actually served, but most scientists agree that they played a part in the rituals of very early inhabitants of the area. They are related to number of the most famous ancient arts in the world. Overnight in tents. Catamaran daily distance: 15 km. Day 11. Tuesday: Day of rest. Breakfast. You can recover and check your equipment. You can go boating (and for fishing) on the White Sea or hike or bike and look around in the nice village. Late afternoon the Banya (real Russian sauna) is hot and you can swim in the sea to cool down. A delicious dinner will be ready. Overnight. Day 12. Wednesday: Breakfast. 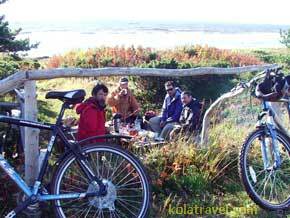 We start a biking part of our Polar tour in the South part of Kola Peninsula. Bike along the coast; weather-permitting, a swim at a sand beach. Lunch by the sea. Overnight in tents in wilderness. Campfire dinner. Biking distance: 50 km. Day 13.Thursday: Breakfast. We have to bike several tens kilometres until the next point of our destination - Kashkarantsy village. Kashkarantsy is one of Pomor villages which keeps old houses how they were one hundred years ago. People who live there trade in fishing. Later on the shore there is the Chapel of one "Unknown Monk". The origin of the Chapel comes from the XIII century when no villages existed at the White Sea coast and fishermen lived close to the sea in separated houses named "Tonya". This is also a nice place for having lunch-break. We continue to bike to Amethyst Rock on the Cape Ship – a high rock standing in the sea. It consists of Amethyst rock and we can it easily find there. Then we continue our way up to"Lodochny Ruchey". Campfire dinner. Overnight in small wooden houses in more persons rooms on the White Sea shore in wilderness. 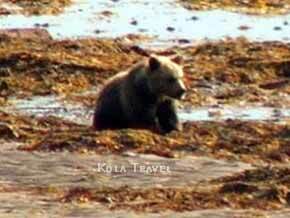 In the evening we go for bear watching on the bike and you have a very big change to see wild bears. Biking distance: 45 km. Day 14. Friday: Next morning we will find ourselves still surrounded by plentiful nature of the White Sea. Breakfast around the campfire. We bike eastwards on the shore along ebb-tide to the mouth of Varzuga River. This is the most east point of the Kola Peninsula what we can reach by own power. Our off-road bus will pick us up and we drive via dunes to the very old village Kuzomen dated of 17th century. Late afternoon we will arrive to Varzuga village - the earliest settlement on the Tersky Coast of the White Sea. In the village we stay in a cottage. 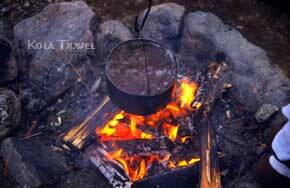 Sauna and a delicious farewell dinner prepared by the locals hosts is waiting for us. Biking distance: 40 km. Day 15. Saturday: After breakfast transfer by the off-road bus to Kandalaksha city. Lunch. Transfer to Murmansk airport for departure. Optional: Transfer to Kuusamo or Rovaniemi airport in Finland. The participant must have experience in hiking in stony areas, biking cycling in hilly areas, pedalling on a streamline and must have a good condition. Prices auf request.Click here für an offer! • Medical and Rescue insurance which covers helicopter evacuation in emergency case.